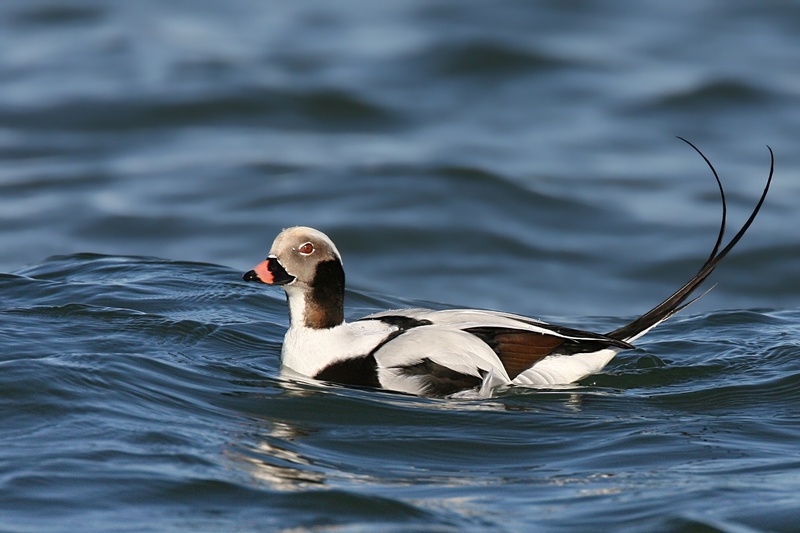 Long-tailed Duck populations are in trouble in some parts of the world. Photo by Wolfgang Wander, Wikimedia Commons. It’s no secret that Lake Michigan waters are important for recreation and tourism. Thousands of summer tourists flock daily to its shoreline to boat, swim, and play. But scientists have recently determined that those crystal-blue waters are also crucially important for Long-tailed Ducks, an attractive, deep-diving waterfowl species. So important, in fact, that in May 2015, a 200-mile stretch of open water, from Allegan County to Benzie County, was designated a Global Important Bird Area. IBAs, as they are known, can have state, continental, or global significance. The program was developed by BirdLife International, which works with conservation partners all around the world. A technical advisory committee convened by National Audubon Society, which administers the U.S. IBA program, decided the Lake Michigan Long-tailed Duck IBA would become Michigan’s 10th global IBA. 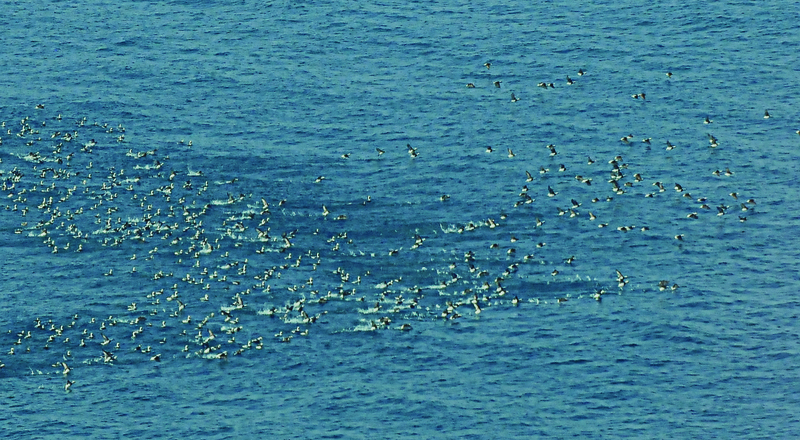 It’s not unusual for huge flocks of Long-tailed Ducks to alight on the lake with other waterfowl in fall, forming giant avian rafts a few miles offshore. Their presence has been observed at Douglas, Grand Haven, Muskegon, and elsewhere. Lake Michigan is a prime stopover site and a place to winter when climate conditions allow. But all is not well with Long-tailed Ducks, readily identified by their black-and-white plumage, pink band on their bills, and very long tail feathers. They were listed by the North American Bird Conservation Initiative in 2014 as one of 33 common species facing steep global population declines. The International Union for the Conservation of Nature (IUCN), a world authority on species in trouble, classifies them as “vulnerable.” And they are threatened in other parts of the world. “It’s not a species in trouble here. But, if you have a huge population in one area, a single threat like avian botulism could affect so many birds,” Putnam explains. That was the basis for upgrading the Lake Michigan waters from state to global IBA. Long-tailed ducks breed in the Arctic. Photo by Joel Trick. Long-tailed Ducks breed and nest in the Arctic tundra. They migrate south to winter on oceans and freshwater lakes. IUCN reports drastic population declines in the Baltic Sea, one place they winter, but the U.S. Fish and Wildlife Service reports that two million are currently found in North America. The global population, according to BirdLife International, is estimated between 6.2 million and 6.8 million. Michigan’s IBA program was launched in 2006. It now lists 103 Important Bird Areas, 93 of which are state IBAs. Some are tiny, such as Bear Island in northern Lake Huron, a two-acre state IBA for Black-crowned Night-herons. Others are much larger, as for instance the 10,000-acre Fort Custer Training Center and Recreation Area IBA in Kalamazoo and Calhoun counties, which is home to Cerulean Warblers, Wood Thrushes, and Yellow-billed Cuckoos, among other species. 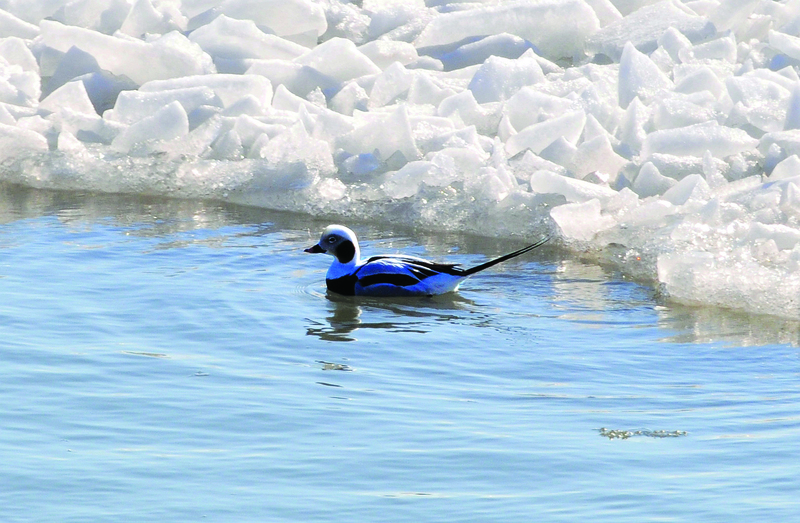 The Lake Michigan Long-tailed Duck IBA encompasses 625,401 acres of open water in a region where offshore wind generation has been considered. The designation may not stop a decision to build, according to Putnam, but it does inform those who make those decisions. 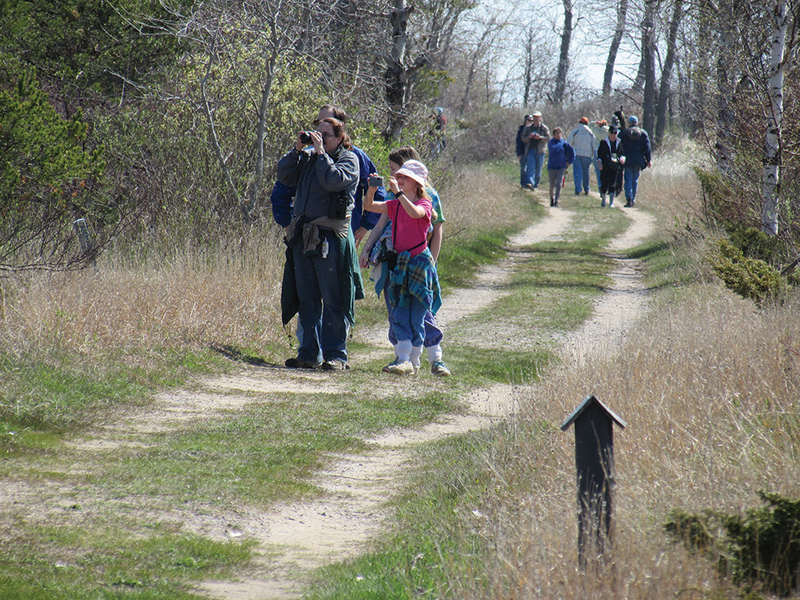 Birders at Tawas Point Birding Festival © Brad Slaughter. Michigan public land managers say IBA designations are useful. Knowing they exist can help with land-planning decisions. An IBA designation can even enhance a tourism brand, such as at Tawas Point State Park, which is now being marketed by the state as a major birding tourism destination. Chuck Allen, the park manager, said the 200-acre state IBA designation there gave him the leverage he needed to restrict recreation at the tip of Tawas Point, a sand spit sticking out into Lake Huron where visitors once took dogs and rode bicycles, and a place that birdwatchers were loving to death. “We always wanted to control what happened out there, but didn’t have the authority to stop people from getting off trail, and we didn’t have enough staff to do enforcement,” Allen explained. “The IBA designation allowed us to designate the point as a Primitive Zone in 2013. With that, we were able to get more funding for signage and a big kiosk at the trailhead that talks about birding at the point and proper etiquette,” Allen said. One example Schaefer offered occurred with a scheduled timber sale. Wanting to avoid cutting trees were Cerulean Warblers nest, she moved the scheduled cut to a different part of the game area. IBA designation made a difference in St. Clair County too, at the 25,472-acre St. Clair Flats and Harsen’s Island state IBA. It has five state species of conservation concern: the American Bittern, Black Tern, Forster’s Tern, Least Bittern, and Marsh Wren. The designation drew attention to the area, and a cooperative research study between Detroit Audubon and the Michigan Department of Natural Resources followed, focusing on the survival success of Black Terns. To see a complete list of Michigan’s State, Continental and Global IBAs and the species that live there, go to http://web4.audubon.org/bird/iba/michigan/. Appears in September/October Jack Pine Warbler. magazine of Michigan Audubon. This entry was posted in Uncategorized and tagged BirdLife International, Birds, Conservation, Environment, International Union for the Conservation of Nature, Lake Michigan, Michigan Audubon Society, National Audubon Society, Nature, Waterfowl. Bookmark the permalink.